Here is just a sample of the extraordinary artwork Chris is capable of. As you can see by the Unbelievable detail of these tattoos, Chris is one of the best tattoo artists in the country. 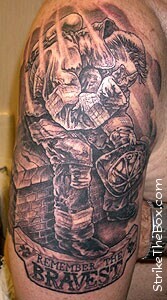 All three of these tattoo were inked on members of the Nashua NH Fire Rescue. Just click on the photo for more info about these tats.